There are a wide variety of industries and applications that require effective, efficient vinyl welding. Whether you manufacture awnings, tents, banners or other products that require the joining of vinyl, you need a solution that can handle this tough material while still producing an effective seal. If you have been on the lookout for a hot air welder for vinyl, you are not alone. Finding the right vinyl welder can be the key to a successful vinyl-using manufacturing business. You can certainly look for alternatives to vinyl, but the durability, fire, oil and chemical resistance, as well as the strength, makes it such an ideal material for many applications that finding a suitable vinyl welder can be a much more viable solution. We provide industry-leading vinyl RF welders that are durable, reliable, and effective. Contact us directly today so we can learn more about your specific equipment needs and provide a lasting solution. If you have struggled to find vinyl welding machines that meet your needs, we recommend one of our very effective Radio Frequency bar welders. The RF bar welder’s simplicity belies its efficacy as a vinyl heat sealer. Our machines use radio waves to heat up the pressure bar which then heats the vinyl and seals it. The process is very similar to the way your microwave heats your food. The effect is remarkable. The vinyl you need to seal quickly softens as you apply heated pressure from the bar (or bars) that then creates an incredibly tight, seamless seal when it cools. Once you have seen an RF bar welder in action as a vinyl welder, you will probably never consider any other method again. Why Should You Use RF Bar Welders for Vinyl Welding? In addition to the quick and seamless seal the RF bar welder can generate for your vinyl material, the process of this machine is much safer for the rest of the fabric than other methods — you can be confident that the machine will seal your vinyl without damaging other parts of the product. If you are concerned about the environment in your manufacturing process as well, you will also appreciate that this heating method does not generate smoke that could potentially release additional toxins into the atmosphere. 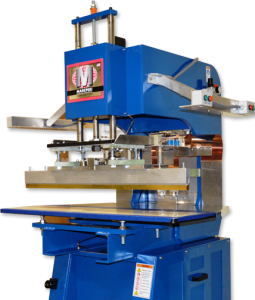 Why Choose MarkPeri for Vinyl Heat Welding Equipment? Once you’ve settled on radio frequency bar welders as your vinyl heat welding equipment of choice, you want to get your RF welding machine from the most trusted supplier possible. For many businesses, that continues to mean 3KRF, a division of MarkPeri International. For over 30 years, we have been distributing state-of-the-art and refurbished RF welding machines. If you want knowledge, experience and commitment to customer satisfaction when shopping for a vinyl welder, you want 3KRF. We have a tremendous array of RF welding machines to suit almost any company’s fabric welding needs, product goals and budget. Our team of experts will be more than happy to review all of our available options and customize a solution for your company. To get started, please get in touch with us now.